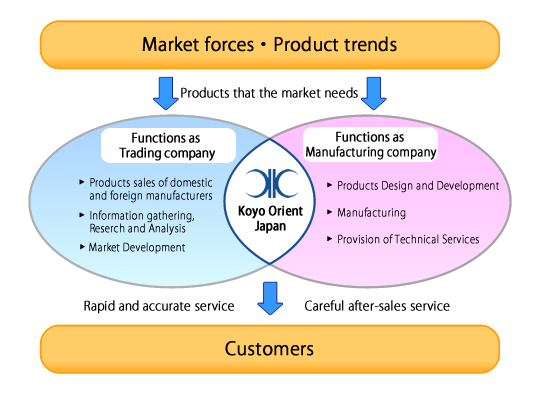 Business Contents | KOYO ORIENT JAPAN CO., LTD.
We always keep up with the latest market trends and propose appropriate products that meet the demand of customers in a timely manner. In addition, we have both “trading company functions” and “manufacturing company functions”. With those functions, we are ready to propose a comprehensive solution by introducing state-of-the-art technologies, as well as by developing, designing and manufacturing our original products. We have overseas bases in China and South-East Asian countries that have made a remarkable development in recent years. Making use of its overseas network, we have been making rapid progress not only in the optical industry but also in various fields. In our overseas branches, we are operating community-based business activities by local staff, in accordance with the management policy of “independent, self-reliance and self-responsibility”. We are also offering up-to-data information and demands / requests of the region so that our clients could develop their new products, explore new business opportunities, become a local distributor and so on. The overseas offices play important roles in expanding sales channels and facilitating new business development. In addition, they are indispensable for ensuring a stable supply in the face of a production increase, and avoiding the risk in times of natural disasters and emergency situations by decentralizing the supply route.